The Baptist Health Foundation of San Antonio is honored and excited to select Dr. Fernando Guerra as recipient of our 2014 Spirit of Health Award. Dr. Guerra is a Professor of Pediatrics at Baylor College of Medicine in Houston and San Antonio and the Children’s Hospital of San Antonio. He has also served as an Adjunct Professor in Public Health at the Air Force School of Aerospace Medicine at Brooks Air Force Base. He is Adjunct Faculty in Management, Policy, and Community Health at the University of Texas, School of Public Health In Houston. In 2010, Dr. Guerra retired as Director of Health for the San Antonio Metropolitan Health District after 23 years of service. He oversaw the operation of 32 health locations throughout San Antonio and several areas of Bexar County. During his tenure, Dr. Guerra instituted improvements to the immunization program to include a model immunization registry and established a vaccine study center. 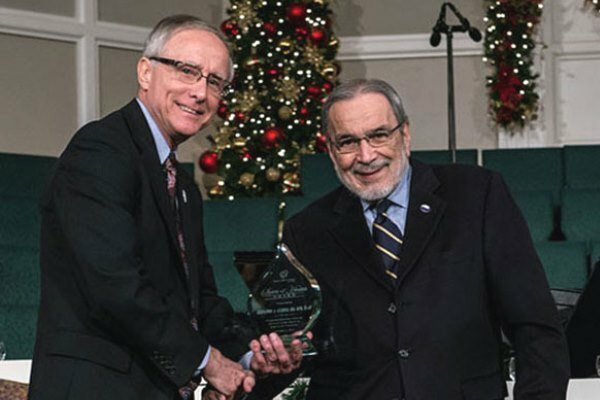 Through his career, he has been involved in efforts to address child abuse and neglect; domestic violence; unplanned childbearing; obesity; and health disparities. These and other initiatives led by Dr. Guerra have raised the stature of San Antonio as a center of public health excellence. While serving in many capacities, Dr. Guerra has remained active in the practice of Pediatrics, currently as a member of the VIVA Pediatric Group practice in San Antonio. We are grateful for the outstanding leadership of Dr. Guerra and are delighted to present him with this award. In his honor, a donation has been made to the State of Texas Kidney Foundation.